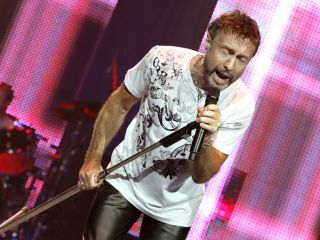 Paul Rodgers singing Walk This Way with Aerosmith? Hey, it could've happened. Currently on a break from his reunion tour with Bad Company, Rodgers recently addressed the rumor that he was approached by the Boston heavyweights when it appeared that Steven Tyler was going AWOL last year. "Well, yes, I was, actually," Rodgers told Spinner.com. "Joe Perry came up to me at another awards celebration. And he said that Steve was not really interested in touring anymore at the moment, and they were all ready to tour and that they were looking for somebody to take that slot." Tempting as the offer might have been, Rodgers says Perry, "'You know, maybe you guys ought to rethink that.' And I'm happy to see that they're up and running now because they're a fabulous band." Rodgers said that part of the reason for his reluctance to rock the mic for Aerosmith was that he had already done something similar with Queen, although he was quick to point out that "Queen was an exception - joining forces with an actual band that existed. Because in the past I've always formed a band and then written a whole catalog of songs for that band." Elaborating on the subject of Queen, the singer said, "We played together at an awards show in London, and we played each other's songs. If it hadn't worked for me on a musical level - from the heart - I would have never have even gone near it. But it did work. We actually played All Right Now, We Are The Champions and We Will Rock You together, and it was just amazing. And so we thought we can do all of this as a new entity - Queen and Paul Rodgers - and we'll make it clear to everybody that it is a new entity. I'm amazed that I actually spent four years with them, which is longer than I was with Free."